With a proliferation of Japanese restaurants in Ho Chi Minh City, it’s hard to imagine a new one offering something unique. But in the delightful little restaurant lane off Le Thanh Ton St in District 1, Yoshiki Kondo manages just that. He is General Manager of Gyumaru Hamburg & Steak (8/3 Le Thanh Ton). Gyumaru is not what you might expect. It’s not a burger joint, nor is it a steakhouse. It is a quintessentially minimalist Japanese dining experience rotating around the style of meat meal Westerners would be quick to link to a gourmet burger, but without the bread. It also offers Western steak dishes and Japanese barbecue. And, of course, as one expects from the Japanese dining culture, presentation and perfection is everything. Before we get to the meal, here’s an explanation for those unaware of the Hamburg steak concept. The Americans have been eating Salisbury steak since 1897, a recipe created by a physician who was an early pioneer of the low-carb diet for weight loss. Much like a burger patty or meatball, it’s a blend of ground meat – usually beef – vegetables, breadcrumbs and herbs and sometimes egg. The Americans eat it with gravy and mashed potato or noodles. Hamburg (ハンバーグ hanbāgu, steak) is the Japanese version, made from ground meat with finely chopped onion, egg and breadcrumbs, flavored with spices and made into a flat, circular shape about a centimeter thick and 10 to 15 cm in diameter. Gyumaru makes them a little larger and rounder, but the concept remains the same. Many restaurants in Japan specialize in variations of hamburger steak, including hanbāgu topped with cheese (or chizuhanbāgu) or hanbāgu with Japanese curry. 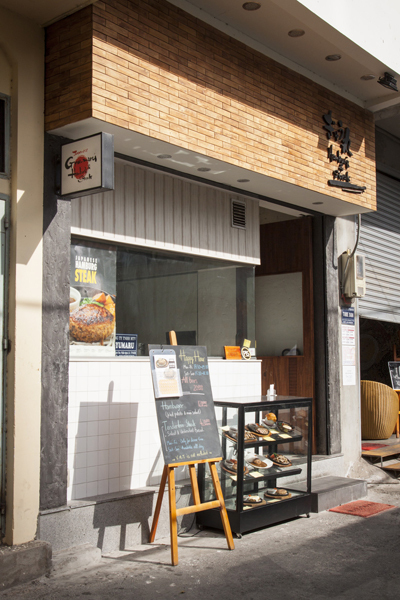 Gyumaru Hamburg & Steak is housed in a typically narrow Vietnamese style shophouse, the ground floor featuring a glazed kitchen affording every customer – and passersby – a view of the shiny stainless steel food preparation area. It’s immaculate and the team of chefs are in an organized frenzy when we arrive – testament to the popularity of the eatery, despite its newness on the street. Inside, the dining room is cozy, yet functional, the guests a mix of Japanese businesspeople, local Vietnamese who are in on the secret and some foreigners. There are more tables upstairs and a small private function room is available. The service, from our arrival to departure, was warm and friendly; our waiter Albert speaks excellent English and was happy to explain the menu and offer his recommendations. 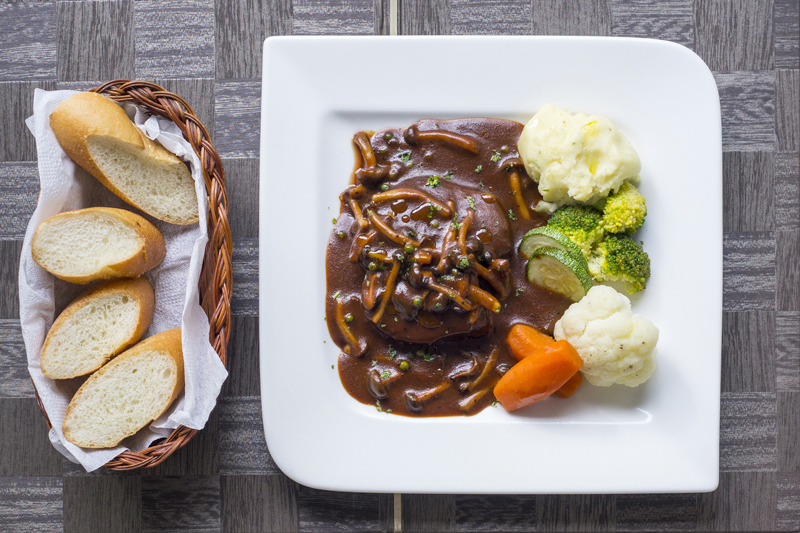 The house signature dish is of course the Hamburg Steak – and it comes in six large but very affordable variations: Gyumaru, Cheese, Japanese Style, Stewed, Stewed Cheese or Deep Fried. You choose your size – medium is recommended for between VND158,000 and VND210,000, but for those with more modest appetites, there is a smaller option (VND128,000 to VND180,000) or for the big eaters, large at VND188,000 to VND240,000. We took the mid-sized option – which was more than filling – of the Cheese Hamburg Steak. My companion chose the US tenderloin steak, cooked medium rare and served with salad and unlimited bread for VND420,000, which, given the size of the cut, was excellent value by Vietnamese standards. After just one mouthful, it was quickly obvious why the Japanese have embraced the Hamburg concept, adapting it to their own palate. The meat mixture was fresh and tasty, the meat and herbs contrasting the thick slice of cheese melted over the top. It was moorish, tasty and smooth – far smoother than a patty you might encounter in a burger bun in a Western restaurant, no matter how ‘gourmet’ it might be labeled. The dish was served with crunchy sprouts, greens, carrots and roasted potatoes, and a crisp green salad. It came to the table on a cast iron plate resting on a wooden base, juices still simmering in the bottom. My companion was equally delighted with her US steak which was tender and juicy, perfectly cooked and served with a generous mountain of mash, cauliflower, broccoli, carrots and zucchini…this is about as healthy as a steak dish could get. 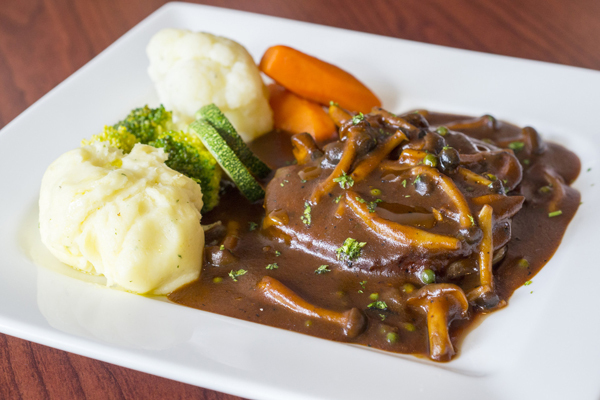 The chef’s special sauce was a savory gravy mixed with thinly sliced vegetables and whole mushrooms. Even with just a salad and bread for starters (the bread was sliced baguette served with olive oil), it proved too big for her alone. If you’re not keen to try the Hamburg Steaks (you really should! ), Gyumaru offers Japanese curries, seafood barbecues, salads and soups as well. And there is a small children’s menu. In the unlikely event you’re not full after the main course, there are desserts – cake of the day, sorbet or ice cream. Also, uncharacteristically perhaps for Japanese eateries, there is a small but well-priced wine list including a Spanish Cava and three red and three white wines from Chile, Italy and Spain. A glass for VND110,000, bottles from VND450,000 to VND800,000. Not surprisingly, word of this new entry onto Ho Chi Minh City’s dining scene is spreading fast and Gyumaru has responded with a bento box takeaway and delivery service. You can order or take away any of the items on the menu for home consumption – and the team in the kitchen are open to requests for variations on the menu items. 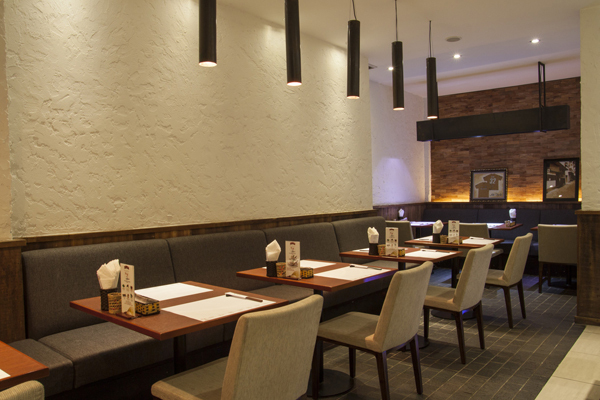 Fresh, healthy, innovative cuisine in a relaxed, cozy environment – Welcome to HCMC, Gyumaru!